This beautiful 3 bedroom villa with pool is located in the hamlet of Kastelir, just a short drive away from Porec. The villa is pleasantly furnished inside. There are 3 bedrooms and 3 bathrooms all luxuriously furnished. One bedroom with its own bathroom is on the ground floor, while two other bedrooms and one bathroom are on the firsth floor. On entering, the lounge, kitchen and dining area are on the ground floor with a balcony overlooking the swimming pool. The spacious, tastefully decorated living room has large comfortable sofas and forms a cozy seating area. Kitchen is fully equipped with modern equipment. 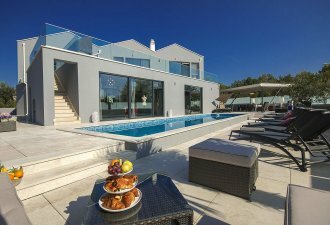 In front of the house is pool area with luxurious sun loungers, an outdoor dining area, BBQ and comfortable chill out area. Here you can rest on the sunbeds or take the shade under an umbrella and watch the kids play.